After your payment is confirmed, you will be emailed the instruction includes the link to the download page. 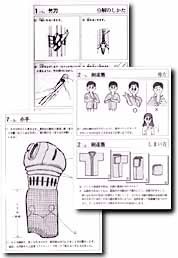 Please follow the instruction to download a Kendo Manual. Please refer to the instruction email regarding the download limit and expiry. *You should enter a correct email address or you cannot to download a Kendo Manual. Why are the jackets and trousers made of cotton dyed with indigo? Copyright © 福田武道具-FUKUDA BUDOGU- All Rights Reserved.